Well what a twelve months it has been! This time last year I was in my final build towards Pennine Barrier, having had osteitis pubis diagnosed but confident I could still start Lakeland 100. A year later and despite a great run at Pennine Barrier, my hips fell apart shortly afterwards. With a DNF at Lakeland, a stress fracture in my pelvis and several months off running, I am only now finally returning towards full fitness. It’s been a difficult few months, slowly building the running back in. My adductors continue to cause me problems and it is certainly not the pain free running I used to enjoy before the injury. My mileage is up and the medical professionals are confident that the injury has healed. It is now just the case of working through the pain, and easing out the stiffness in the muscles and tendons, which developed to protect my fracture. As part of my recovery I’ve been working a lot on my core strength, flexibility and diet. The later is still very much work in progress but I have dropped some weight as a result and am the lightest I have been before a race in many years. When Theshold Sports approached me back in January and kindly offered me a place at one of their races, I was in two minds. At that point in my recovery I was trying not to think about racing. Last autumn I finally realised that my race commitments were leading me to make bad training decisions, which were having a negative impact on my recovery and were actually making the injury worse. As a result, I was reluctant to start to build a new race schedule until I was confident I was fully recovered. I explained the situation to Threshold, who were really understanding and happy to support my recovery. 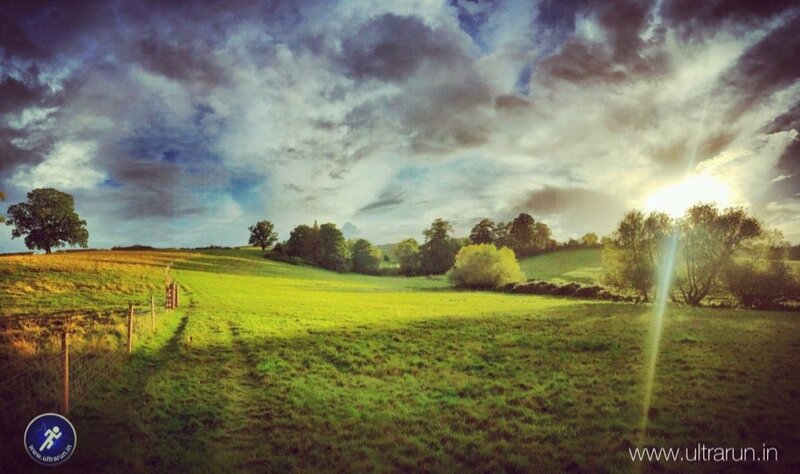 A few years ago I had enjoyed running along the Cotswold Way above Cheltenham, through the beautiful rolling landscape. The Heineken Race to The Tower, one of three races put on by Threshold as part of their Threshold Race Series, gave me the opportunity to return there and explore more of The Cotswold Way. It also fitted well timing wise. 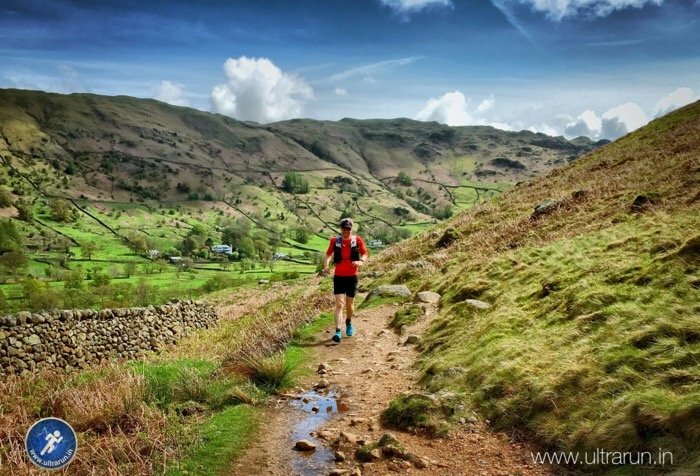 A June start gave me four months to get back to running fitness and at seven weeks out from Lakeland 100, would also be a perfect test of my injury and, all being well, help build my fitness into Lakeland. So I accepted the place and tried to put it to the back of my mind, as I focussed on my recovery. Slowly I built my mileage and as the weeks passed, my confidence grew. A weekends running in the Lake District with my wife, finally gave me the green light to commit to the race. Covering over twenty miles in one day, with no ill effects, I finally felt like I’d overcome the worst of my injury and could call myself a runner once again. A sudden week of international travel in the lead up to the race, is not exactly the best preparation but it can’t be helped. Fortunately the training is now in my legs, so I can just focus on getting as much rest as possible, staying flexible, with a couple of short runs to turn the legs over and keep them loose. So as I write this on a transatlantic flight, the start of the race is less than a week away and I have to admit to being a little nervous. It’s been over ten months since I have prepared for a race and I feel a little lost. What was once routine, now seems so strange. It is like being a novice ultra runner once again and I find myself writing list after list of things to remember. I also still have some uncertainty/fear about my injury. Will it hold up to fifty plus hilly miles? The furthest I have run this year is twenty two miles, which won’t even get me to half way! So what is The Heineken Race to The Tower? 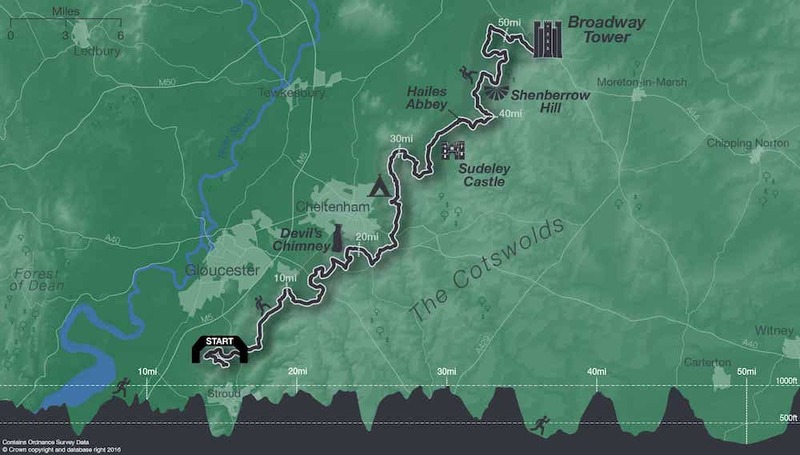 It is a 52 mile race along The Cotswold Way National Trail from Gloucestershire to Worcestershire, starting near Stroud and finishing at Broadway Tower. 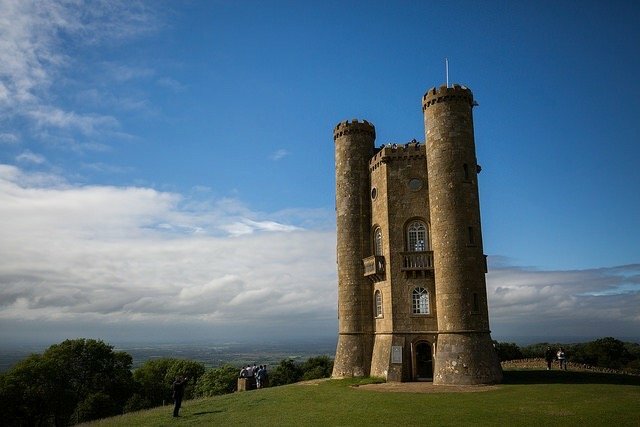 There are numerous historic and geographic landmarks along the way, including Sudley Castle, Belas Knap, Devil’s Chimney, Stanway House, Cooper’s Hill and of course the magnificent Broadway Tower. The team at Threshold Sports really know how to put on an event and regularly top the list at The Running Awards. Participants have the choice of completing the race in one go (as I have done) or breaking it over two days, with an overnight camp at half way. Participants are free to either run or walk and there are plenty of checkpoints along the way to offer support. Being a point to point race can be an issue with logistics but again Threshold have us covered, with shuttle buses and car parking provided in either direction. I am parking at the finish and taking an early shuttle back to the start on Saturday morning. This should get us there a little over half an hour before the race begins at 8am. With our race numbers posted out to us, this removes the need to register, so its simply a question of dropping off our bag for the finish, a final kit check, the obligatory loo stop and we will be off. That is the plan at least! The kit list is quite light, in fact rather than a mandatory kit list there is just a recommended list for this race. This means I am free to make my own choices about what I carry. I am not planning on being silly and will be carrying pretty much everything on the recommended list but will be making some tactical choices to keep the weight to a minimum, something I am sure my hips will appreciate. Food is another consideration I am have been mulling over. I have been working on my diet a lot during my recovery. One positive change I have made is to dramatically reduce the amount of bread in my diet, many days cutting it out entirely. This was a hard thing to do as I love fresh bread. However it was making me feel sluggish whenever I ate it and I definitely feel a lot better without it. The issue is that many races, RTTT included, provide sandwiches at checkpoints, amongst other things. These have always been my go to food choice when passing through checkpoints, so I now need to come up with a different plan. Threshold have been good enough to provide all participants with a menu, so I can plan ahead and think about what I may need to carry and what I will be able to grab at each checkpoint along the course. Finally I will, as always, be using Mountain Fuel Xtreme Energy in my water bottles during the race and am excited to try their new Raw flavour, which has a subtler taste. I will also be following their complete system, using the Night, Morning and Recovery Fuel both before and after the race. I won’t be carrying a tracker but I am race number 482 and you can follow all the action over at the live event page. I am also toying with doing something a little different for this race and posting some updates during the race on my Facebook page. If nothing else, it should be interesting to look back and see how my spirits change during the race. So there we have it. As always, wish me luck and I’ll be back after the race with my full race report of The Heineken Race to The Tower.